Nibbana Shade. This is a secured village which is located in East Side of Pattaya. The village provides 24hr security gated community, tennis courts, fitness center and a communal swimming pool. 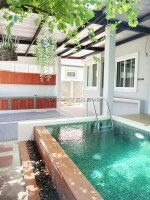 It's only a 5-10 minutes drive to Sukhumvit Road, Pattaya City and all local amenities i.e. supermarkets (Makro, Tesco or Big C), the beaches, restaurants and etc. This is a 3 beds / 2 baths house located on 78 sq.wah land plot. with 162 sq.m. living space. The house is sold fully fitted with built-in kitchen, ceiling & floors, built-in closets, curtains, quality fitted bathrooms. There is gated off-street and covered parking. Living area : 162 sqm.